he Art Of Atari: From Pixels To Paintbrush is an in-development coffee-table book that celebrates what some see as the golden age of video game packaging design. I won’t keep it on my coffee table, though; I’ve got children who would absquatulate with that and sleep with it. Also, I don’t have a coffee table. My five-year-old came downstairs at six-thirty this morning. “I had a good dream,” he said, pleased. “What did you dream about?” I asked. What kind of narrative would have he built in his nocturnal slumber? “We had ice cream,” he added. And that’s all I got out of him. The copy of this book that I own is the 50th Anniversary Edition. Ponder that for a moment. This is the second Ellery Queen novel, and it dates from 1930. 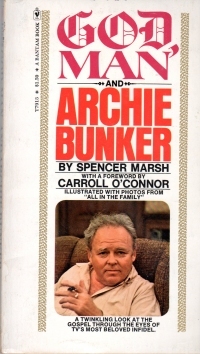 The mass market paperback I have is from 1980. 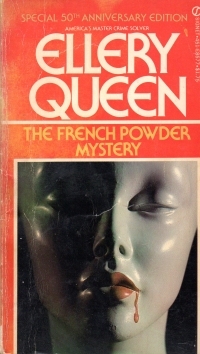 Ellery Queen (the original duo) wrote a bunch, and his name appeared on other books and short stories as well as other media and a mystery magazine, to the extent that his works were still in print for fifty years. Also, do the arithematic, and discover that the fiftieth anniversary edition was thirty-four years ago. Man, we’re old, you and I. At any rate, this book revolves around a murder in a New York Department Store, the kind that only New York city has or had. The wife of the owner of the department store is found dead in a furniture display one morning, and Ellery Queen and his father have to puzzle out why she was killed and why her body was hidden in such a fashion as to delay discovery until a certain time. Signs point to the woman’s missing daughter, who is probably a heroin addict. And Inspector Queen has to tackle a heroin ring and a new Police Commissioner. The book has a locked room feeling that other Queen books (as I recall) do not, so it was pretty dry going, and the whole thing a bit gimmicky to fit into the locked room subgenre as much as it does. But it’s early in Queen’s writing career, and he got better. Or I was more patient with these books when I was reading them in great detail in the 1980s. The book answers the question Agatha Christie or Ellery Queen? that I posed last year when I used the expression making one’s toilet. In this book, Queen completes his toilet. I had to write the word coördinate while reading this book, and I included the umlaut. Coming soon, I shall drop French phrases into my conversation, and I’ll make sure they sound italicised. Overall: The book’s not the best of Queen if I remember correctly. Good enough if you’re into the locked room stuff, but I’ve moved away from it. Not bad enough to make me swear off Queen stories. I’ve looking through the archives here, and I don’t have any book reports for Queen novels. Has it been ten years since I read another? It probably won’t be another ten years. Comment for a year that you’re thinking about getting a new suit since you haven’t owned one in fifteen years, since you got that one for $5 at a flea market but ruined it by getting grease all over the back of the jacket while helping prepare the hall for the wedding reception of your then beautiful girlfriend’s friends. Receive a gift card for a men’s clothier for your birthday. Pick out a tasteful suit, and by “pick out,” I mean let the salesman do it for you. For an extra charge, they will actually put animal tags in them for you. Match up the tigers on Sunday morning. Tell everyone that you came to church in your birthday suit. This will never, ever get old. And so I think, you know self-directing machines are going to hit the farms first, where they can go along in their laser-and-GPS-guided finery to handle the time-consuming chores of farming with far less insurance liability concerns. Just imagine when this becomes mainstream, at least as mainstream as farming is, and automated farm machines can work day and night on ever larger farms. Great swaths of land will really become food farms, and it’ll squeeze out the family farmers most likely. Will the prices go down for commodity foods (but remain high for the locovore organic artisan stuff), or will it put Google in charge of our food supply? Regardless, I’m getting my robot insurance before that, too, is nationalized. Last night, my beautiful wife and I went to the wine shop. What did I get? What television told me to. You know the target markets for these two products do not generally overlap. Or do they? Fun Science Fact: These bottles actually repel each other like magnets. I said like magnets because I was being all Bill Nyey and dumbing it down for the lay people. The actual force in play is disdainetic force, and it’s only present in the Downton Abbey wine. The disdainetic force does not repel; instead, it is repelled. 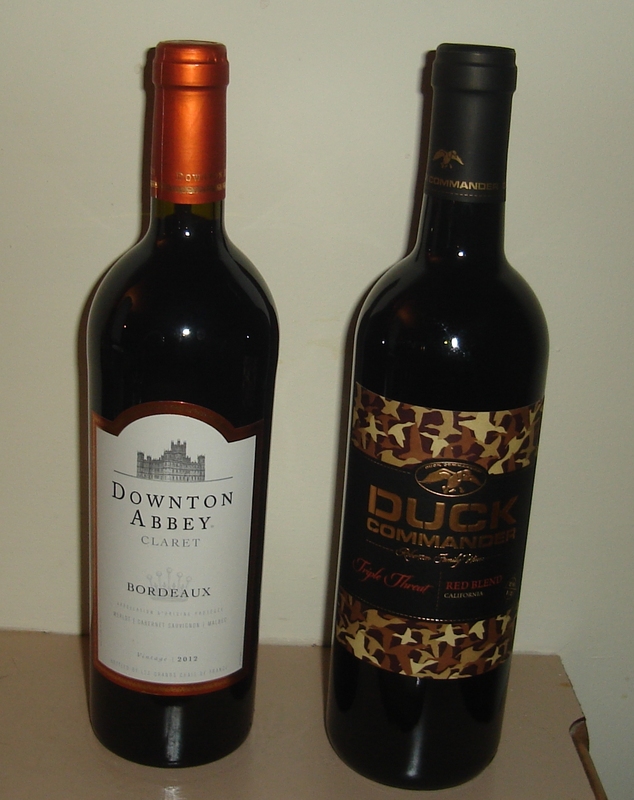 The Downton Abbey wine is repelled by the Duck Dynasty Commander wine bottle and wants to move away from it. The Duck Commander wine has no disdainetic repulsion in it and does not care what other wine bottles are nearby. There are plans to build the country’s largest single family residence in northeast Edmond. Last year, the Edmond Planning Commission was asked to give approval to a mega mansion on the northwest corner of Sorghum Mill Road and Westminster Road. “It’s truly a castle,” says Bob Schiermeyer, who saw the first renderings late last year and tells News 9 the plans call for a draw bridge and spires that reach 90 feet. Well, it’s just a story until I mix my own brand of disturbed into it. As the monolithic structure began to rise on an isolated mountaintop in Missouri’s Ozarks, the chatter grew: Who was building this cement castle? The massive structure will require several thousand yards of concrete to build. The building materials include a concrete additive that contains tiny pieces of wire that will allow the structure to withstand everything from an F-5 tornado to a bomb blast. Tornadoes are certainly a concern, as Pensmore is in rural Christian County, Mo., not too far from Joplin, the town that was ravaged by a powerful tornado on May 22. I got two words for you: Marcher lords. This is the Internet, after all. What do we have to do around here but speculate wildly? Although I have to admit, if I had the dinero for it, I think I’d have a castle built, too. With the recent unpleasantness in Ukraine, is it time for Hollywood to reboot Red Dawn and make the bad guy the Russians? In other news, I might as well just retitle the blog Recycler, hey? Forget the Wayback Machine, here at MfBJN, you get the full experience of my Web presence from across the years. My old AOL Web page which is not as cool as Ms. K’s, it does the complete text of a couple of short stores, a couple of essays, and my two chapbooks Unrequited and Deep Blue Shadows. Also, student, you can see that my preference for dark backgrounds and light text goes back almost twenty years. But it’s gotten better. Toht or Not, ca. 2003, which was hosted on Geocities. I’m only a Compuserve short of the complete collection of old timey Internet presences, gentle reader. And long time readers might recognize the images therein reappeared in my blog series from 2006-2007 Ask Dr. Creepy. As you know, my predilection for a fedora and trench coat goes back twenty years, but I look slightly less creepy now. Or older, which might make me less creepy. Who knows? I wrote the AOL Web sites on an old AMD 2/66 and uploaded them to AOL. And I’ve backed them up and copied them over every time I’ve gotten a new computer for the last fifteen years. So you’re seeing them in the original, although I admit I corrected some typos in the hard-coded links as I updated them. I was not a software tester in 1998, so I was just happy to have something on the Internet. Maybe someday I’ll share with you old message threads from BBSes that I’ve saved off or the hundreds of pages of emails my beautiful wife and I exchanged between the times we were simply two USENET readers with a common interest and the time she moved to St. Louis. Because I’m a pack rat, and that goes for digital, too. As you might remember, gentle reader, I enjoyed Bing’s novels Lloyd What Happened and You Look Nice Today. So when I saw this book with its subtitle The Ends Justifies The Meanness, I picked it up. It’s about 150 pages of brief chapters covering things Bing posits Machiavelli would do, such as He would like when necessary, He would make a virture out of his obnoxiousness, He would fire his own mother if necessary, and so on. Each little maxim is given a couple of paragraphs or maybe a couple pages of support and elaboration, often with examples of well-known CEOs or leaders behaving badly. Even though it’s 150 pages, it’s a schtick that goes on a couple ticks too long. 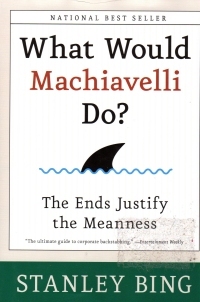 It depends upon the common pop-cultural shallow reading of Machiavelli, where the people see it as a justification for people in power to behave badly instead of an examination about the way power works and how to best achieve and retain it. It looks like Bing has a number of books in this ilk available; I’m sure not going to race out and get them. If I find them at a book fair, I might give them another whirl, but in the long form, I like his fiction. To much nonfiction Bing at one time might be too much of a good thing. I’ve been blogging for over ten years now, but I’ve been sharing my opinion for longer than that. In the late 1990s, I had a little email newsletter called “The Cynic Express(d)” which I sent out to a couple dozen people. I’d started it back when I was on America Online and fished out a list of people who had “cynic” in their profiles (I was spamming before spamming was cool, then uncool). I made a Web page to store and serve up these emails (and, as I mention often, I thought “Hey, wouldn’t it be cool if I could just type the content in and have a database back-end serve up the content in the Web page?” thus inventing the blog except for the part where I put effort into inventing the blog). Instead, I hand-coded (hand-copied and pasted) each page as an HTML file. And when I redesigned the site, I’d have to hand-edit all the pages. The site also includes a couple of book reviews and the columns I wrote for the Marquette Tribune (my college news paper) in 1991-1992. Going back over them, I’m nostalgic for the times and anecdotes I cover in them. I’m also startled a bit about how much I’m going on about the same things that I do today. Government health care makes an appearance, of course, and Ellen Degeneres… Remember her sitcom was cancelled fifteen years ago. The real question I leave you with is… Why has Ellen Degeneres not aged in fifteen years? UPDATE: Thanks for the link, Ms. K. Unfortunately, my old AOL pages seem to have eluded the Wayback Machine. But I’ve got them collecting dust on my current hard drive ready for exhumation in due time. Hey, VftP readers, you’ve already heard me pitch my novel John Donnelly’s Gold and The Courtship of Barbara Holt, hey? They’re available for the Kindle at .99 or in paperback. I gotta keep flogging them if I want to get to the milestones of 100 copies and 6 copies respectively. Thanks! So I was taking my urchins to school yesterday, and I was behind this pickup with a brake light out. He’ll never see it, of course, since he’s sitting in the truck with his foot on the brake when the failure occurs. I could have let him know by getting out at a stop light and tapping on his window, but that’s a good way to get an sudden leaden tracheotomy in these parts. Then I thought to myself, you know, if only I could text to him based on his license plate. I’d send something to KC0WUT, and if he logged into it, he could get the message. He could also set his cell number to get the messages delivered as texts. It could be helpful for these sorts of “You don’t see it, but….” Kids–although kids don’t drive or cruise much these days–could use them while cruising to flirt. And, yes, there’d be a lot of griefers complaining about driving, but people would have to log in to get the messages, so it would definitely be opt-in in nature. I told my beautiful wife about it over lunch, and we spitballed some requirements. She didn’t immediately tut-tut the crazy idea, so maybe it wasn’t so crazy after all. The app which allows admirers to contact any car owner in the country. All you do is sign up to the website or app and send a message or a ‘wave’ to any registration plate. Kinda like what I imagined, but less focused on the getting-laid-because-I-have-a-Ferrari thing. Come on, Charles, did you have to post it the same day I had the idea? Couldn’t you have waited a couple days? Anyone want to hear again the story about how I thought up a database-driven Web content display mechanism that let users enter posts which were rendered in HTML in reverse chronological order in 1997? I have the ideas, but not the programming skill nor enough money to afford a Ferrari and a team of developers to implement them. They’re Gonna Take My Fedora For This, But…. Any song that Frank Sinatra did that Eydie Gorme also covered, Eydie Gorme did it better. People got a little crazy during a routine design meeting in the Firaxis Games offices, where the developers of Civilization V take strategy very seriously. A designer talking about his recent playthrough to a large group of his gathered colleagues casually mentioned he didn’t like the starting position of his settler so he moved it that turn to look for greener pastures. The reaction was immediate. Half the designers in the room erupted in anger and disbelief – while the other half vehemently defended the move. They ditched what the meeting was supposed to be about, and instead argued for or against a specific move in the first turn of a Civ game. Clearly, this issue was very important. Sid Meier once said that all good games were a series of interesting decisions, and it’s a testament to the power of Civilization that even the first decision could evoke such a strong reaction in the current Civ team at Firaxis. I don’t play Civ V because, well, when I got it, it challenged my computer, and, secondly, the Steam login every time I started my computer was a pain and its TSR components lingered and impacted my machine’s performance even when I wasn’t playing the game. Also, I’m feeling a little old to learn new game concepts after, what, a decade on Civ IV? But I don’t tend to move my settler the first move unless I’m moving off of a desert or frost square onto a better grassland or plain square where I can still build my first city on the first turn. I also have a host of other bad habits, such as playing the easiest level even after a decade on it. In Civ II, I am pretty sure I tried upping the difficulty, but I just dabble in this game, and a long (or short) frustrating learning-style game just wouldn’t satisfy me. So I also abandon a lot of games early when I don’t start in a strong enough position. Because I’m doing this to be entertained, not to learn something. With McDonald’s recent innovations in having double order boxes in their drive-through lanes but still only one set of windows, they’ve codified a practice that should fill them with shame: asking someone in the car to please pull forward. Let’s unpack just how disparate these words are when jumbled together. For starters, once you’ve been asked to park, it’s not longer a drive-thru. Man, how I hate to misspell it to keep up with the current marketing-based illiteracy. But if you park your car and someone brings you your food, it’s car-hop service, not a drive through. I go to a drive through because I want immediacy. I want to grab a sack of food I’ll regret later and be on my way. I don’t want a moment to reflect on the significance of signage at McDonald’s. If I had this much time, I’d have stopped at Sonic. Priority? Obviously, my priority was continuing to keep in motion. If we’d adhered to my priorities, I’d be a mile or so down the county highway by now. No, my sitting here fits with McDonald’s priorities of getting more money in the cash register inside the window by shuttling people through with ever-increasing speed. Obviously, it’s past the point where they can adequately service the customers in a timely fashion. Also, note I’m parked in the second pull-ahead spot. I’m not even the top priority among the secondary priority customers. A drive-through pick-up? The very concept wars with itself. And it’s not a pick-up except when I’m parked there. It’s a quick toss of a sack through the car window before the employee runs back into the McDonald’s before you discover the error in the order. 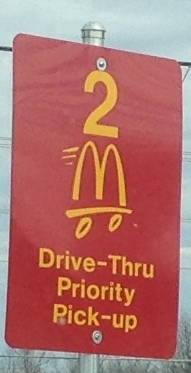 At the normal drive-through window, you can sort through the sack and account for the received goods. If there’s a discrepancy–because, as Leo Goetz says, they make mistakes in the drive-through–you’re right there at the window to demand remediation. When you’re at #2 Drive-Thru Priority Pick-Up and the employee has run back inside and out the back door for a smoke break, you’ve got to further impede your vehicular progress by exiting your car and going inside to get your missing cheeseburger. Suddenly, your exclusive “priority” “drive-through” experience involves walking into the store. Bah. I’m glad I’ve mostly put drive-through dining in my rear view mirror.